Rhode Island « R-V There Yet? We drove up to CT a few days ago. We skirted around the heavy populated areas. The drive up there was like driving on a Dallas freeway all day long. And it was raining the whole time. Not a relaxing day driving a 5th wheel.On the way up to CT we stopped at the New Jersey shore and went to the beach. 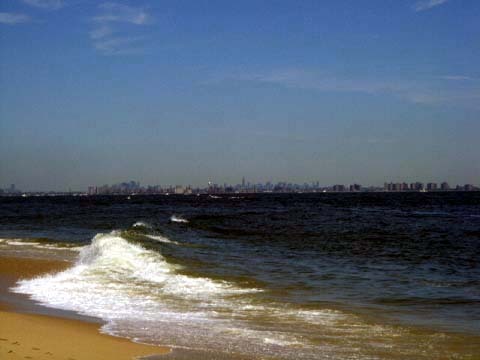 Our view from the beach was New York City. The picture doesnt do the view justice. It was very awesome looking across the bay and seeing NYC. In some old movies they talk about Beach Clubs, having cabanas and having cabana boys. In one of the towns by the beach they have about 8 Beach Clubs. We went on the internet and read about the ones we saw. They are much like Country Clubs to us. You join for the season, have a cabana, restaurant, swimming pool, beach access, and activities for the children. It can cost $1,700 and up to $18,000 for the SEASON depending on the beach club and what you want to pay. $1,700 gets you a season pass and a locker for your stuff. A nice cabana is like an efficiency apartment. Because of the price of $18,000, up to 4 families share a cabana. 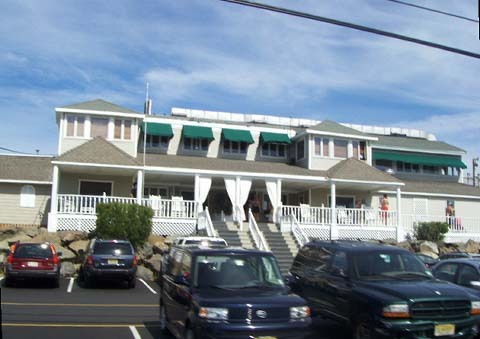 The main idea of a Beach Club is that you can have an access to the ocean. New Jersey has some strange driving patterns. There are no left turns or U turns on city streets where we were. All left turns were made from the right side lane. You would circle around to the right 180 degrees and be perpendicular to the street you just left. Sometimes that right 180 degree turn would circle to the right, sometimes to the left, sometimes it before the light and sometimes beyond the light. It really keeps the traffic from backing up but confusing. The other thing we noticed about NJ highways is they do not spend a lot of the budget on directional signs. One day we drove around and missed quite a few turns. So the next day we went over the same roads and quickly saw why we made so many mistakes. They will have junction signs. No advance warning to which lane you need to be in to turn. Then right at the junction they will have the signs to go north or south. You are always in the wrong lane or miss it completely. If they just happen to have an advanced sign about a turn it will be obstructed by tree branches. Tolls are very high in the east. It cost $5 to go across a bridge. In one day we spent over $30 in tolls. CT was up and down hills, very New England and beautiful. Most of the roads we traveled on were 2 lanes and busy. On our return trip to VA we went a different route away from the populated cities. It was a much easier trip and it wasnt raining except for one rain shower in PA. PA was very pretty. On the trip down to VA we could see the countryside and the entire sky. We didnt get claustrophobic with tall trees right beside us and only seeing the sky right above.We are heading to the Outer Banks of NC and SC for a few days. Then we will spend a few days in Savannah, GA before heading to Daytona and then to the Tampa, FL area for a few weeks. We left VA yesterday heading toward CT to see Ricks mother, younger brother and family. We are taking our time driving the route. Yesterday we were in VA, drove through Maryland, Delaware, came real close to PA and stopped in NJ. It was a different driving day than when we drove up the east coast. On the 4th of July we drove through downtown Atlanta. As soon as we left Atlanta, GA and all the interstates in between through VA we only saw our side of the interstate, tall, tall trees and the sky right straight up above us. That is all!!!!! Even through towns and large cities. The only way we knew we were in a town or city was the traffic increased and our GPS showed on the map that there were city streets all around us. Every once in a while we might see a shopping mall or a tall building through the trees. When we were in Maryland we actually saw the city of Baltimore. Delaware and NJ do not have the tall trees to hide everything, or at least not near the coast. We even saw pastures and corn growing. Of course, the RV park where we are staying has trees all around us. That means we cant use our satellite dome to pick up TV. At least they have cable here. We still have a blog to write about our trip to Mt. Vernon which we will write real soon. You are currently browsing the archives for the Rhode Island category.